Bunculuka Camping Resort si trova a Baška, Litoraneo-Montana, è situato vicino al mare. Il campeggio a terrazze e campeggio con terreno collinare dispone di piazzole delimitate, sia ombreggiate che, senza ombra e piazzole poco ombreggiate. Bunculuka Camping Resort si trova nei pressi di una spiaggia sassosa. È possibile affittare roulotte e casemobili. Il campeggio dispone di un parco giochi e di un campo sportivo. Per gli sportivi, il campeggio prevede un programma di escursioni e passeggiate con accompagnatore. Ci sono un programma di animazione. Nelle immediate vicinanze potete fare il bagno in mare. Al campeggio Bunculuka Camping Resort è possibile praticare snorkeling e windsurf. Non è sempre necessario cucinare, perché all’interno del campeggio ci sono pizzeria, ristorante selfservice e ristorante con ampio menù presente. In campeggio è possibile acquistare pane fresco. Potete navigare su Internet, poiché il campeggio dispone di uno o più computer con collegamento a Internet e nell'80% del campeggio potete navigare con il vostro portatile. Ogni anno un ispettore visita il Bunculuka Camping Resort, controllando oltre 200 tra attrezzature e altri punti di interesse del campeggio. L'ispettore è un dipendente ACSI e non lavora per il campeggio. A very smart site. Despite the signs saying that clothes are prohibited about a quarter of the guests were \'textile\', even on the beach. The site has been bought by a large company and the prices have rocketed. Incredibly pretty place, but oh so steep both in gradient and price. The site is on a steep hill that we estimate the slopes on site to be between 10 and 20%. The pitches are terraced and pretty level but slightly difficult to access and ours had a tree right in the middle that was not helpful at all. 10 amp hook up and water close to every pitch. Toilet facilities good but need checking more often by site staff. Bins often full and very smelly. Site rules not enforced so expect dogs off leads, speeding drivers and cyclists. Beach was packed during our stay and despite a rule stating places were not to be kept we noticed the same sheets and towels on the beach permanently in order to save space. Worse still was the extortionate charge for sunbeds and parasols. The site fees do not reflect a site that has no pool, very limited facilities for accessing the beach and sea and so hard to get around. Although this is a naturist site and signs insisting so, there were a lot of full time textiles about the place. If you are very fit and healthy, like steep hills and not worried about site limitations but want a stunningly pretty area to camp you may like this. We visited this site because it sounded really good but were so disappointed. The reception staff immediately told us that the ACSI pitches were at the top and far side of the site, furthest from the beach, and that the more convenient pitches were more expensive! Nevertheless, we went and looked at the 'ACSI" pitches and discovered that the whole site appears to be terraced at an angle of around 30 degrees, so much so that from one pitch you can look right over the roof on the 'van below! The continuous steep angle of the paths and roadways made walking any distance - even to the toilet block - to difficult to contemplate on a regular basis and we fail to understand how the site can be rated as disabled friendly, as it would be impossible to push a wheelchair up the hill. Consequently, we left without reaching any of the toilet blocks, or any of the facilities apart from the reception office. We really don't feel the site should be included, however lovely it may be, if the only pitches allocated to ACSI members make full usage of the facilities impossible. We went from there to Camp Konobe which, though also terraced, offered ACSI pitches right down at the beach and was very pleasant. Volete prenotare il campeggio Bunculuka Camping Resort o oppure saperne di più? Potete farlo usando i seguenti dati oppure tramite il sito del campeggio. Prima di Baska tenersi sulla sinistra in direzione Valbiska e FKK, quindi seguire i cartelli. 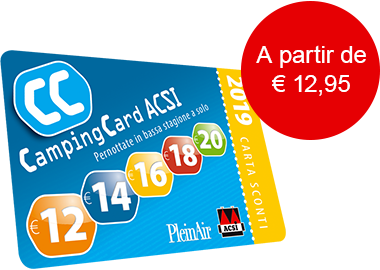 ACSI Eurocampings invia la tua richiesta di informazioni al "Bunculuka Camping Resort".